People of various cultures converge in this arrondissement where the second-largest Chinatown in Paris can be found. Immigrants have been settling here, in Ménilmontant and Belleville, since the middle of the 19th century. An old working-class district, this area is getting to have more of a yuppie character. 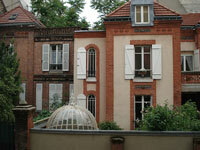 Despite the diversity of its residents, though, its architecture still has a traditional Parisian character. The fascinating Père-Lachaise Cemetery with its various carved tombs of past luminaries is the main tourist attraction here.